Here's every one of my 'What Emmeline Wore In July' illustrations to date! It's been a busy two weeks! In the blog post for Day 15 I've written about everything I've learnt from this challenge so far (read it here). It's definitely been tricky at times, in particular managing my time whilst working on commissions, not having full weekends off and making sure my outfits are illustratable! I've even dealt with someone (supposedly giving advice..) saying "are you sure you can do that? An illustration every day?" (well, yes!). But as with many of these month-long challenges, it's been a brilliant learning curve for upping my illustration skills. I've also had great support from some of my favourite brands involved, including Cath Kidston, Moheda, Wolf & Moon and Poppy England (with more to come!). 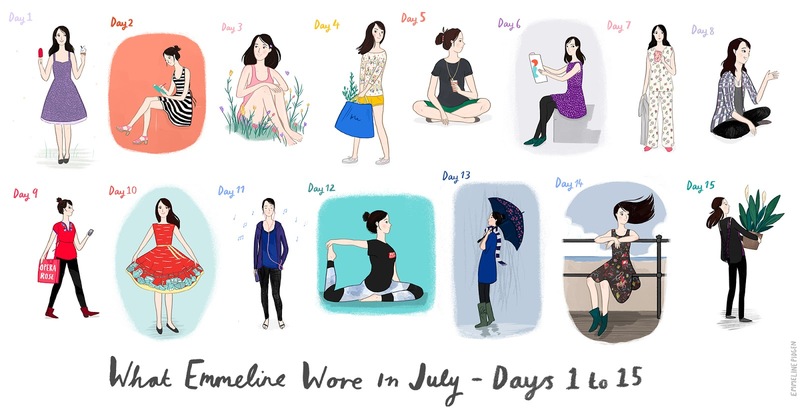 Keep up to date with the project by following 'What I Wore' on my blog, Bloglovin', Google Friend Connect or following Emmeline Illustration on Twitter or Facebook. 16 more days, cheer me on! Love your style of illustrations and also what a fabulous idea, illustrating what you wore. Lovely blog.